As the winter months are well on their way, now is the time to start planning your next ski holiday. Though Australia has its fair share of resorts, with a cheap flight you could enjoy an exhilarating winter adventure on a New Zealand ski holiday. Whether you opt for the bustling adventure capital of Queenstown or the scenic North Island spot of Mt Ruapehu, you’re bound to enjoy a ski holiday of a life time. Check out our four favourite New Zealand ski resorts to scope out which location is best for you. No matter what your ski level or agenda, Coronet Peak is a renowned crowd pleaser. As the South Island’s most popular ski field, Coronet Peak boasts terrain for all levels as well as a sealed road from Queenstown all the way up to the resort, making driving conditions much easier than other ski fields. From 5 beginner runs, 16 intermediate and 14 advance runs, Coronet Peak has something for everyone including off-piste runs and long groomed trails. Between July and September Coronet Peak also offers night skiing on the weekends. If you’re just starting out on the slopes then you might want to try Cardrona, an alpine ski resort located between Wakana and Queenstown. 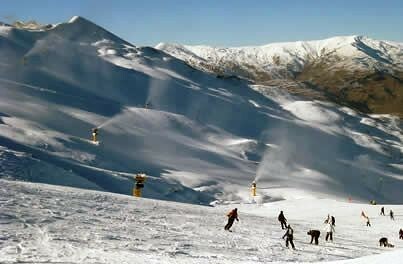 Cardrona has an elevation of 1870 metres and spans 345 hectares of skiable terrain. The groomed slopes are popular for both families and friends alike with 9 runs for beginners and 15 for intermediate skiers. Cardrona also has a challenging course for snow boarders, as well as a great ski school for beginners. Treble Cone is Cardrona’s rambunctious neighbour, a ski field where adrenaline junkies can enjoy the thrills of New Zealand’s longest drop - an exhilarating 700 metres. While beginners and intermediate ski levels can have their share of fun at Treble Cone, the ski resort is dominated by expert runs ideal for experienced skiers. In fact, Treble Cone is home to the most black runs in the country. Bring your brave face and take the plunge. Located on the North Island, Mt Ruapehu is not only the country’s largest active volcano, but is also home to the largest ski resort in New Zealand. Across its terrain is a good mix of beginners and advanced runs, while intermediate skiers are spoilt for choice with 50% of the terrain. One of Mt Ruapehu's biggest drawcards is its ample off-piste and freestyle terrain complete with bowls, chutes and a half-pipe. Mt Ruapehu also has the highest ski lift in New Zealand, and naturally boasts spectacular snow covered views. Choose your own adventure competition - WINNER! !